We don’t offer cookie-cutter enclosures like many of our competitors. Instead, we provide screen enclosures that are tailored to our customers’ wants and needs. Available in many styles, sizes, and configurations as well as wall and roofing materials, our enclosures will blend with the architectural design of any home, meeting the requirements of even the strictest homeowners’ associations. 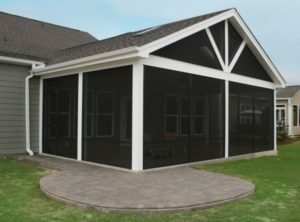 Our screened in patios are constructed from high-quality materials that will last long into the future and require minimal maintenance to keep looking like new. For example, we use high-performance screens that are exceptionally durable and provide a beautiful viewing area. And, all of our enclosures are built according to standards set by the Florida Aluminum and Glass Association. What’s more, we use only highly trained and experienced installers to complete every project to ensure it meets our exacting standards. So, if you’d like to enjoy the beauty of your outdoor living area without dealing with hassles, like insects and the intense sun, contact Porch Outfitters today to learn more about the custom screened in patio we can build at your home in Bluffton, SC.